Up to now, the only publicly known details of Toy Story Land has been on the two new attractions, the Slinky Dog Coaster and Alien Swirling Saucers. Since the Slinky Dog Coaster looks to be quite large I’m hopeful Disney will have another restaurant in the area. Maybe even a Table Service!! Woody’s Lunchbox is an outdoor “snack kiosk” type restaurant. According to the concept art it will have outdoor seating nearby. We’ll of course bring all the details on Toy Story Land as the become available. Will you stop by Woody’s Lunchbox for a bite? 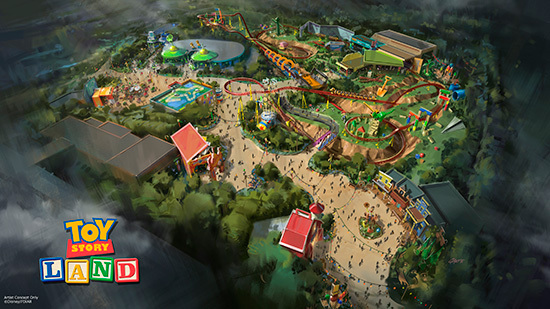 Are you looking forward to Toy Story Land?? Leave your comments below or as always, feel free to reach out on Twitter, Instagram or Facebook!